Gadget Lab/Wired har fått känna lite på Microsoft's nya portabla mediaspelare - Zune 2. De jämför den bland annat med iPod Touch. Zune 2 finns i flera olika varianter, en med 80GB hårddisk (Zune 80), och två flashminnesbaserade spelare med antingen 4 eller 8GB minne (Zune 4 och Zune 8). Mer Fakta. Klicka vidare för fler "Live" bilder. 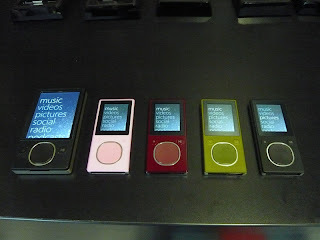 Hands On with Zune 2 on Gadget Lab: "'We believe in the magic of software,' Bill Gates told the 15 journalists gathered at Microsoft Zune headquarters in Redmond, Washington for the relaunch of Zune for the 2007 holidays. But will there be enough magic to create a buzz around its music business? Microsoft is hoping so, unveiling two new players, a totally redesigned software client, an a social networking website meant to integrate seamlessly into the whole thing."